When using the normal dosage rate, the copper level is 0.26 ppm. This is well below the acceptable Australian Standards level (0.3 ppm) and also below the WHO (World Health Organisation) level (1.5 ppm).What prevents the copper in Lo-Chlor Pool Algaecide from dropping out of solution and staining the pool?Lo-Chlor Pool Algaecide is a specially formulated product containing a unique organo copper complex. This simply means that the copper ion has been complexed to stop it from coming out of solution and possibly causing a pool to stain. The added bonus is that the complex last longer in the water and provides extra algae protection. 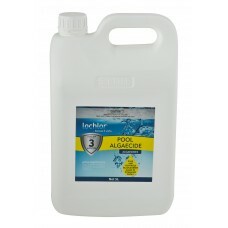 We guarantee that Lo-Chlor Pool Algaecide will not stain a pool. (This guarantee is dependent on the pool being maintained within Australian Standard levels for balanced water and Lo-Chlor Pool Algaecide being used according to the stated directions). (50WA5L): LO-CHLOR WINTERISER ALGAECIDE 5LITRE The Original LONG TERM ALGAE TREATMENT OVER WINTER..
(50AKO5L): LO-CHLOR ALGAE KNOCK-OUT 5LITRE Valuable Treatment For RESISTANT ALGAE STRAINS Or..